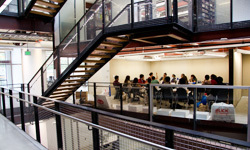 The graduate interior architecture program at Drexel is uniquely situated to offer the best education and career opportunities. Students benefit from gifted peers, outstanding faculty, world class facilities, and an unmatched depth of resources. Our highly ranked, CIDA-accredited program is supported by a top university with a distinctive vision, and we maintain a principal position within the academic and professional worlds. Interior architecture at Drexel is characterized by a focus on human experience, novel explorations of materials and form, commitment to a sustainable future, and a rigorous professional training. Read more about our PROGRAM. There are new things made, presented, discussed, challenged, won, and made again every day. See some examples of our STUDENT WORK, or check out what is going on via INSTAGRAM, TWITTER, or FACEBOOK.